Moonshine legend and American original character Marvin "Popcorn" Sutton has had his sentencing delayed for the fourth time. He and his many fans (of whom I am proud to consider myself one) will have to wait until January 26th 2009 to find out what's going to happen to Popcorn stemming from the raid by them "evil revenuers" on his 'shine operation in Tennessee back in March. For those who are just tuning in, Popcorn Sutton - who has achieved the status of mythic hero in the world far beyond his home in Maggie Valley, North Carolina - was the target of a bust when he started an operation across the state line in Tennessee. The Bureau of Alcohol, Tobacco, Firearms and Explosives (BOOOO!!!) caught Popcorn running three 1,000-gallon moonshine stills and immediately set out to portray him as a diabolical fiend. Nothing could be further from the truth. Popcorn Sutton is simply, and without harm to anyone, practicing a fine form of art that reaches back countless generations into Appalachian culture. And speaking of which, a few weeks ago filmmaker Neal Hutcheson sent me a DVD of his latest documentary The Last One. Hutcheson's films have enjoyed a lot of play on North Carolina Public Television and have often featured Popcorn in a few appearances. The Last One focuses entirely on Popcorn as he sets out to make (what he claims at the time anyway) his last batch of illicit booze. I'm gonna post a thorough review of The Last One here soon but after watching it, I cannot help but be compelled to say that I have even more sympathy for the moonshine industry. This is not something done purely out of a desire to brew some tax-free alcohol: more often than not it was done out of necessity, sometimes even for sincere medical purposes. Not like the government cares though: it seems to be the driving mission of the BATFE and every other guvmint agency to force us to purchase our goods from Wal-Mart instead of making good on our own, which is what Popcorn Sutton was trying to do. 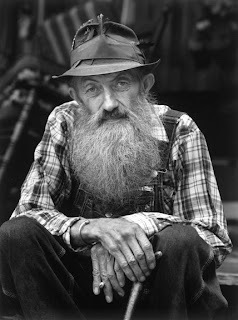 As always, this blog will post updates on the Popcorn Sutton Saga as they continue to develop. And one more thing: FREE POPCORN SUTTON! Have you seen this. It is a Star Wars Fan's dream. Get a "Free Popcorn" T-shirt!